Wait... THAT'S not a Pokemon~! So I'm pretty sure by now it's simply common knowledge that I either start or conclude (or both) these things on a joke... so why should this year be any different? So it wasn't until recently that Yo-Kai Watch made itself known to American audiences and while I liked it there was just SOMETHING about it that seemed a little familiar to me. I dunno... little kid going around, collecting monsters based off Japanese folklore, only using 6 at a time to fight others of their kind... hmmm... now WHAT could it be..? Really though I'm not ragging on Yo-Kai Watch, I actually enjoyed it. Honestly with as piss poor as Pokemon seems to be shapng up for this next installment I'd gladly welcome all of the yo-Kai from Yo-Kai Watch as official Pokemon. They all look vastly better then most of what we've gotten through more recent genberations... but I digress. While Yo-Kai Watch definitely holds it's own in many regards it uh... yeeeah-you gotta call it like it is, right? 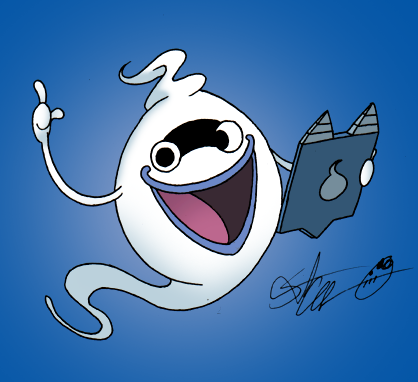 Pokemon clone or no, I love Whisper as a whole and him being a ghost certainly fits right into the Halloween aesthetic as is, so why not get this month started off right?